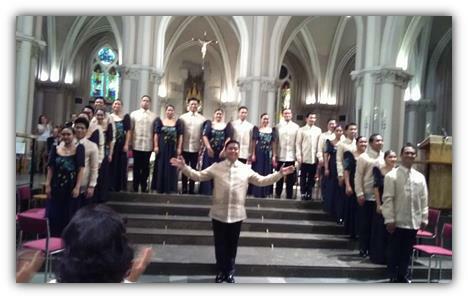 The Madrigal Singers under choir Director Mark Anthony Carpio (L) together with the Coro Voces Graves de Madrid under choir Director Juan Pablo de Juan. 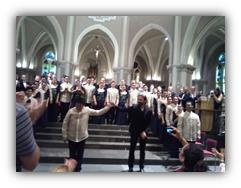 The Philippine Madrigal Singers received a standing ovation and a thunderous applause from their audience for their performance at Madrid’s Basilica Parroquia de la Virgen Milagrosa on Friday, 29 July 2016. 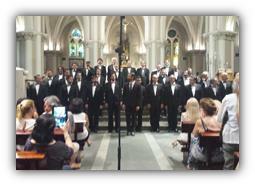 The said performance was the second part of the 9º Encuentro Voces Amigas concert organized by the Spanish all-male choir Coro de Voces Graves de Madrid. The Coro opened the concert with six religious songs in English, Spanish and Latin. The Madrigal Singers and Choir Director Mark Anthony Carpio. The Madrigals’ repertoire included 11 songs. Among these were religious songs Ama Niamo, Magnificat and My God is a Rock, and popular songs such asMarry You, All of Me, The Circle of Life and The Coconut Nut. A non-stop applause by the audience, estimated to be at 600 people, saw the choir belting out one more song, Let It Be. The concert was capped by a joint singing of the two choral groups. The Director of the Coro, Juan Pablo de Juan, expressed his admiration for the Madrigals’ exceptional talent honed by Choirmaster Mark Anthony Carpio. Director de Juan also shared his group’s pleasure at being able to perform again with the Madrigals after four years. The Madrigals last visited Madrid in 2012.